Hello everyone! This week was a fun one in TOR education. As we learned with our teachers in our classes, the Men’s Club was busy constructing the temple sukkah. It is a great space to celebrate the holiday in and we were able to add some fun decorating touches before the Erev Sukkot program Sunday night (which, by the way, was fabulous!). Thanks to the Dads who lent a hand during the set up and the moms and kids who helped to decorate it. You are appreciated! Wednesday – September 30 – First day of Hebrew School (4th-7th grade) and Teen OR (8th-10th grade). Pizza will be here by 6:10om, students need to be in class by 6:30pm. Wednesday – September 30 – 6:30 – 7:30pm. Planning meeting for the Family Challah Bake. If you are on the committee or are interested in helping and can make this meeting, please do! Friday – October 2 – Shabbat Services – this will be our first family Shabbat of the year. Please plan to attend with your family at 6:45pm as we highlight our youngest religious school learners, the preK and Kindergarten class. After services, stay for the mini cupcake decorating bar during the Oneg Shabbat. Hope to see you there! Sunday, October 4 – TASTY Laser Tag and Pizza @ Laser Craze and Skipolini’s in Rocklin. $25. Please RSVP to Mary or Madeline by Wednesday. This precious group worked hard on their contribution for this Friday’s family Shabbat services. They learned about the 6 days of creation and how God was tired and needed to rest on the seventh day. They created a great little story board for you to see. Be sure to come on Friday and listen to their take on the story! After snack they listened to stories about Sukkot, and discussed what fruits and vegetables they’d like to hang in the Sukkah. Each of them painted a wooden etrog box to bring home. Why did God rest on the seventh day after creating the world? Which day of creation is your favorite? I think we’ll definitely see a theme in all of the classrooms this week! 1st grade also learned about Sukkot. Efrat taught them about the four species of sukkot. 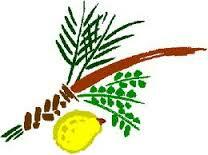 The etrog, palm, myrtle, and willow. Each of the species represents a different part of the human body. The palm branch represents the spine, the myrtle with its rounded leaves is the eyes, the willow is the mouth and the etrog the heart. All of these parts of the body have the potential to do bad things but when we use them all for good, we create happiness in the world. The students also learned the tradition of the Etrog as the royal specie. The piton on the tip is the crown, showing that it is Royal, and it must be there for the etrog to be used with the blessing of the lulav. First grade made some lovely Sukkah decorations as well and also took home a painted wooden etrog. Your 1st grader should be quite the expert in sukkot this week! Ask them about it! Which of the four species is the “Royal” specie? What does the rounded leaf of the myrtle represent? Why do we celebrate Sukkot? As with the other grades, 2nd and 3rd grade did spend some time learning about Sukkot. However, this group started by talking about the Torah. They read about why the Torah is important, how is different from other books and how it is the same. After a brief activity creating fruit and vegetable decorations for the sukkah, this class got to work on their Jewish calendar. Last week, Erica challenged the students to look at the moon on Yom Kippur. Rosh Hashana always falls on a new moon, so the students should have seen something close to a half moon in the sky. As the students learn more about the Jewish calendar and place important holidays on the calendar, they will discover more about the cycles of the moon and how the Jewish months fall (very different from the Gregorian calendar). How is the Torah the same as other books? How is it different? How is the moon significant in the Jewish calendar? As with last week, you already got a brief overview of class from Sara. They are learning to listen for their names in Hebrew – I know, it takes some adjusting! They gained deeper knowledge of the festival of Sukkot and this Wednesday, the whole family will have the opportunity to learn many of the traditions together. I hope every family in this group will take advantage of the great opportunities this class is providing! Again, if you are not receiving Sara’s emails, please let me know. Our sixth graders are getting some great grounding in the Jewish calendar and the cycle of the year. Last week they discussed Rosh Hashana and Yom Kippur, this week they learned about Sukkot and its contrast as a holiday of great rejoicing. They also continued their discussion about Elie Wiesel and his book, Night. Barry has begun his Hebrew pre-assessments to get an idea of where each student is. We have a wonderful madrich in this class who will be working one-on-one with each student on Sundays to help them work through and master the prayers. What is the main difference between the Hebrew and Gregorian calendars? What is the connection between the sukkah and the Jewish people? Why do we shake the Lulav in 6 different directions? Why does Elie Wiesel believe silence is bad? How many years ago was the United States Holocaust Memorial Museum opened? How many people have visited since it opened? Our seventh grade students began their prayer unit with Art this week. In this unit, they will look at the meaning of the different prayers that we recite during the service. This week they discussed what prayer means to them and how they experience prayer. They specifically looked at the English translation of the V’hafta and discussed the personal meaning that they might find in it. When we recite the Shema, what are we declaring? Why? Why is the V’hafta an important prayer in the service? Thank you all again for your support for our education program. We appreciate you!